There are an abundance of accommodations in Harbor Country, which can make finding the perfect one for you difficult. Never fear! We can help make the task easier. Firefly Resort is located in Union Pier, Michigan – about 75 miles from downtown Chicago. Not too far but just a long enough drive to transport you away from the bustling city and into a beautifully relaxing area of Michigan. There are 18 charming cottages, with either 1 or 2 bedrooms. All of the cottages come fully furnished with amenities so you don’t have to bring anything extra. The cottages have screened-in porches and some even have fireplaces for cooler evenings. Back in the 1930s, the Firefly Resort was built as a place for city dwellers to escape and relax, to unwind and enjoy simple pleasures. Coffee on the front porch at daybreak, a blazing bonfire and friends sharing stories, a picnic on the beach, chasing fireflies – this is the life at the Firefly Resort. Just a short walk from our cottages is our Private Beach access where you can swim, play in the sand or even enjoy a game of beach volleyball. Firefly Resort is in the perfect location for Lake Michigan summertime family fun. Don’t worry about setting up a dog-sitter. Firefly Resort is dog-friendly so you bring Fido with you on your Michigan getaway! Take a look at our pet policy for more information and to see which of our cottages allow dogs. Union Pier is located in Harbor Country, the southwest corner of Michigan. This area is full of activities no matter what season — Spring, Summer, Fall or Winter. Check out the other cities in Harbor Country as well. For shopping in Harbor Country, you can browse through antique malls, cute boutiques, art galleries and farmers markets. For nightlife, be sure to stop by Four Winds Casino. It’s the perfect way to spend an evening from gourmet dishes to casual dining options as well as wine, martinis and live music. 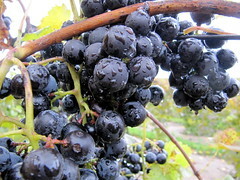 If you like exploring wineries, you will love the Lake Michigan Shore Wine Trail. But if you prefer action instead of relaxation, we have Warren Dunes State Park, Chikaming Nature Preserve and Park, Warren Woods Forest Preserve and Grand Mere State Park. Depending on the season, you can swim, hike, bike, bird watch, or go cross-country skiing, sledding, or tubing. There are numerous golf courses in Harbor Country as well. Check out our Facebook page for even more reasons to plan your getaway at Firefly Resort. If you’re ready to book, you can do so online or by calling (269) 469-0245. Enjoy! It’s been a fairly mild winter so far but we’re ready for spring and all of its signs — warmer temps, flowers starting to come up and spring getaways. Firefly Resort is the perfect place for a getaway. Here’s an inside look at two of our cozy cottages — #6 and #7. You can book your getaway at Firefly Resort online or by calling us at (269) 469-0245. You are currently browsing the FireFly Resort blog archives for January, 2012.